As an admin of an organization with a sponsorship program, you have the ability to transfer sponsors to a different sponsorship in the same program, different program, or our of sponsorships and into a fundraiser. If you would like to transfer from sponsorship to sponsorship, you will need to know the slug of the child you are transferring to. (Ex. /purecharityhaiti/emily-2) Because this sponsor stayed within the sponsorship programs, you do have the ability to move them again if needed. If you are transferring from sponsorship to a fundraiser, again you will need to know the fundraiser name and slug (ex: Pure Charity /purecharity). Because you are moving a sponsor to a fundraiser, this donor will no longer be able to be moved once completed. You cannot move a donor from a fundraiser back to a sponsorship. STEP ONE: Starting from your dashboard, click Sponsorships. Next click the Program Name containing the donor needing to be moved. 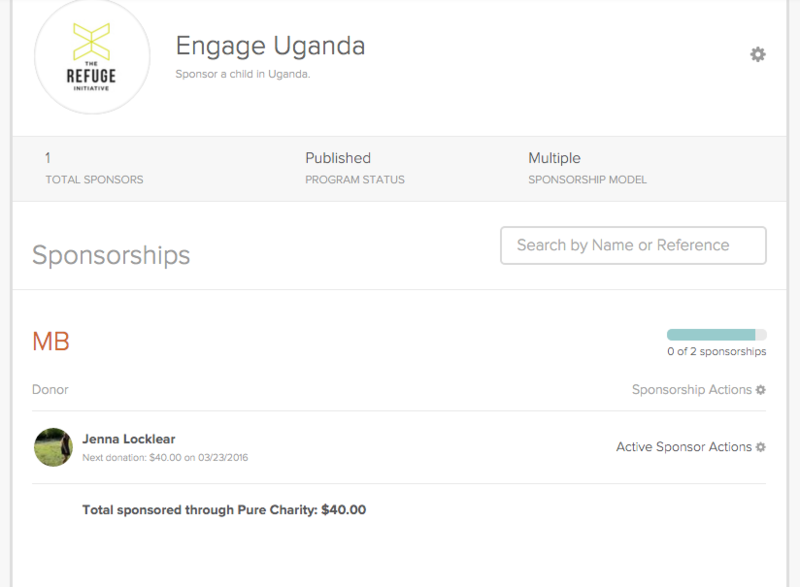 STEP TWO: From the sponsorship program dashboard, scroll until you see the sponsors name. Click the gray Gear Icon. Next click Transfer to Another Sponsorship. 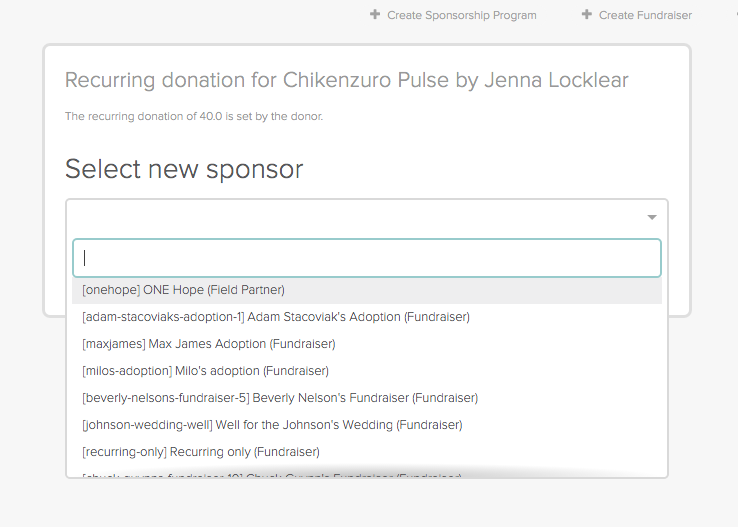 STEP THREE: Type or scroll until you find the new sponsorship or fundraiser you would like the donor to transfer to. NOTE: The options are sorted by [slug] Name (Type). Ex: [Mary-2] Mary Beth (Sponsorship). STEP FOUR: Once you have selected the correct option, click Save. STEP FIVE: The donor has now been transferred! Their billing cycle will remain on the same schedule. If you have questions, please contact you Account Lead or help@purecharity.com.